Stir with ice and strain into a champagne flute. Add 1 tsp of pre-swelled and strained Thai basil seed. Top off with champagne or cava. 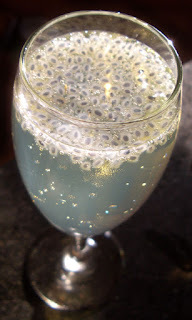 A few weeks ago, I was introduced to the Asian beverage called "Basil Seed Drink" at the Green Goddess Restaurant in New Orleans and knew that I needed some for cocktail purposes. The sweetened beverage came in a can and contained what looked like tapioca pearls a la bubble tea. Except these had a black center that made them look like frog eggs, due to the presence of the basil seed in the center. Once back home, I tried to find the canned beverage to no avail. Through the internet, I learned that it was simple to make the beverage or prep the seeds in one's kitchen. Turns out that the seeds rapidly swell up with a jelly-like coat on their own and do not need to be encapsulated in any sort of gelatin droplet or other. The seed is not the standard Italian basil but a special Thai varietal that is used in desserts and drinks from Thailand to India. Once I learned that it was also called tukmaria, sabja, or falooda seed, I was able to locate some at a nearby Indian spice shop. I placed about a half teaspoon of seeds into a few ounces of water and returned back within 10 minutes to the surprise that the seeds had formed a swelled up coat! By 15-20 minutes, the coat was full sized. To play upon the amphibian egg look, I created the Frog Pond champagne cocktail. The Chartreuse worked with the celery bitters to give some intriguing herbal notes to the drink and the Chartreuse donated a green pond-like hue as well. The rhum agricole added a little funkiness to the mix and the Maraschino liqueur added some sweetness and fruitiness to round out the drink. The basil seeds mainly floated but a few sank only to catch enough champagne bubbles to rise to the surface again. The seeds added an interesting visual and textural garnish component to the drink without adding that much flavor-wise. I am not sure if swelling the seeds in something other than water would change that aspect. what a fascinating garnish! a molecular-mixological-styled component, without any of those chemicals. did you fight swallowing them, or did they go down easily enough? They went down rather easy. Sort of like tapioca pearls but smaller and with less texture. Nothing gross or fishy/froggy about them other than appearance. Very cool. There must be a way to suspend them throughout the drink. The canned basil seed drink I've had seems to have seeds evenly dispersed. Well the first thing would be to avoid carbonation in sodas or champagne. The ones in water sink so it's all about finding the right density. The canned drink may be so thick with honey or other syrup components that they're sort of suspended. This was my first experiment with them which leaves a lot open. Like what happens when you incubate the seeds in say Stirrings orange bitters (water, not alcohol based) -- would they pick up the flavor and the extra density from the sugar in the bitters?